An assistant operation manager works as a subordinate of operation manager. He works under the supervision of operation manager who is a senior professional in any firm. There are many functions that are performed under the supervision of assistant operation manager. Some of the tasks are managing and training the staff of the company to enhance the efficiency of the system and handling IT department of the firm. A resignation letter from an assistant operation is written when s/he wants to quit the job for any reason. The resignation letter can be drafted in many ways by adding a different type of details. The circumstances in which you are resigning decide the type of resignation letter. So, before you start drafting a resignation letter, make complete analyses of the situation you are in. 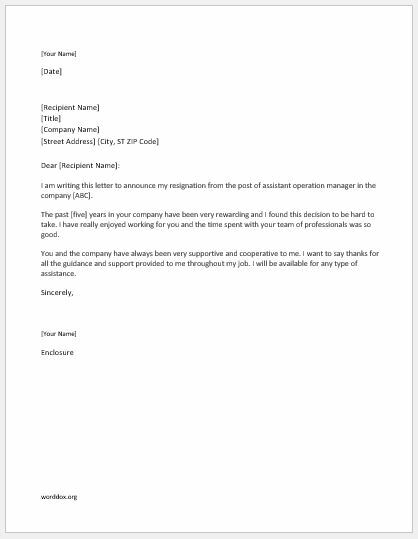 Here is a sample resignation letter from the post of assistant operation manager to give you a clear idea about its format and the structure. I am writing this letter to announce my resignation from the post of assistant operation manager in the company [ABC]. The past [five] years in your company have been very rewarding and I found this decision to be hard to take. I have really enjoyed working for you and the time spent with your team of professionals was so good. You and the company have always been very supportive and cooperative to me. I want to say thanks for all the guidance and support provided to me throughout my job. I will be available for any type of assistance.